Will Grigg insists Wigan Athletic made a real ‘statement of intent’ to the rest of League One by keeping hold of their prize assets on deadline day. 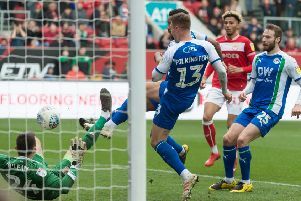 Latics managed to ward off interest from Premier League Brighton in Nick Powell, who celebrated in style with the second goal in the 2-0 victory against Gillingham. And Grigg, who’d opened the scoring against the Gills, says there was never any fear at the DW the squad would be cherry-picked by vultures. “From the inside we had no doubts that was going to be the case,” he said. “We’re enjoying a good time at the moment, the atmosphere around the place is special, and the backing we’re getting from the manager and his staff is fantastic. “Why would anyone want to leave? This is a team on the up, playing some good stuff, so I can’t see why anyone wouldn’t want to be a part if it. “At the beginning of the window, we set out to keep hold of everyone, and maybe add a few – and that’s what we’ve done. Latics managed to add four players during the window, and fans were treated to their first sight of Jamie Walker and Jay Fulton at the weekend. “Jamie’s a quality player, who’s played a lot of games in the SPL already,” said Grigg of his fellow forward, who took over from Ryan Colclough at the start of the second period. Grigg was also delighted with to extend his recent run to 12 goals in his last 15 outings, a clinical finish from Reece James’ pinpoint delivery. “That’s summed up most of my goals to be honest – a real poacher’s finish from close range,” he smiled.